By engineering a regular Atlantic salmon, front, with a chinook gene that instructs growth hormones, AquaBounty can produce a faster-growing genetically modified salmon, back. Here's a comparison of the two at the same age. The Food and Drug Administration doesn't see a need to require labeling for genetically engineered salmon. But Congress does. In the federal spending package approved Friday, lawmakers directed the FDA to make sure the controversial new fish is labeled for consumers. The Massachusetts-based company AquaBounty has engineered a fish that grows to market size faster than Atlantic farmed salmon. The FDA approved the new salmon in November. 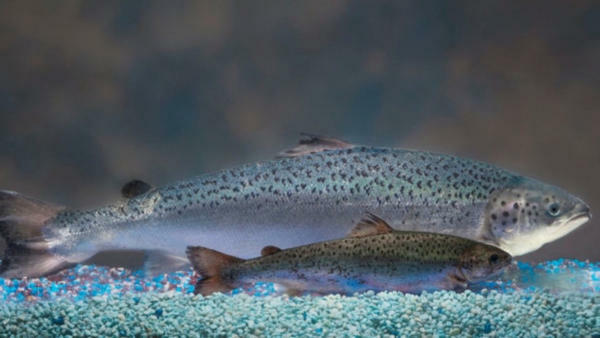 The agency found no material difference between the genetically engineered fish and other farmed salmon, so it made labeling the fish voluntary. "But no manufacturer of frankenfish is going to label it as such," said U.S. Sen. Lisa Murkowski, R-Alaska. Murkowski fought for language in a must-pass spending bill that requires the FDA to develop labeling guidelines before the new salmon can be sold. "At least now people will have the opportunity, the chance to know what it is that they are purchasing," she said. U.S. Sen. Maria Cantwell, D-Wash., said unless the agency reverses its decision to approve the fish, it needs to add a labeling requirement so consumers know "whether they are buying Washington's world-class wild salmon or frankenfish engineered in a lab." Several grocery chains including Costco, Target, Whole Foods and Trader Joe's have said they won't sell the genetically engineered fish. Copyright 2015 ERTHFX. To see more, visit ERTHFX.